Macromolecules in the cell such as DNA, RNA, and proteins are interdependent for mutual synthesis. Within the cell, proteins used for enzyme catalysis, structural components, energy generation, and digestion of food, are produced through an amazing manufacturing process, involving DNA as a template for the three types of RNA (MRNA, TRNA, and RRNA), which in turn act as different components in the synthesis and coding of each protein molecule. But, each step in this complicated synthesis is catalyzed by an enzyme, which, since it is a protein, would have had to be synthesized by the same process! 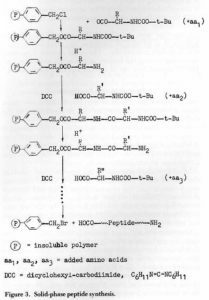 In other words, the end products of this reaction aid in the synthesis of the starting components and catalyzes each reaction along,the way, making up a complicated series of interrelationships. In order to explain life, then, the appearance of this entire machinery must be explained. Macromolecule synthesis in the cell is a very efficient process, far exceeding the efficiency of laboratory synthesis. This difference is due to the enzymatic activity of proteins in the cell. A reaction that takes many minutes or hours with low yield in the absence of an enzyme occurs in a split second with high yield in the presence of an enzyme which acts as a catalyst. form van der Waals bonds. The importance of each amino acid side chain is illustrated by the fact that mutations which change the structure of the enzyme by placing a different amino acid in the enzyme usually render it inactive, although it is true that sometimes one amino acid may replace another without apparent ill effect. This may in turn render an entire synthesis useless in an organism. This will result either in death of the organism, or the organism may have to rely upon an outside source for a nutrient that it once synthesized. Changing an amino acid in an enzyme will often change its shape, making it impossible for the substrate to bind to it and react. How, then, can one account for such a high ratio of active enzymes to inactive enzymes found in life? Another complication in the biosynthesis of enzymes is the fact that even if the amino acids are synthesized in the right order, the enzyme still may be inactive due to the improper folding of the side chains. It is necessary to ensure proper folding of the enzyme during synthesis.’ Otherwise, the enzyme usually folds up in a denatured (inactive) state. The proper conditions for folding to take place are provided by the structure of the cell. The problem of denaturation makes enzymes difficult to isolate and purify in the active form outside the cell. Therefore, gentle techniques are needed for their isolation.4 There may be hundreds of possible denatured conformations compared with one active state. The problem of protein synthesis is simply stated but not so simply realized in practice. Amide links must be formed to specific amino acids in sequence. For the amino acid being added to the chain, the group (amino or carboxyl) which is not involved in the amide formation must be protected first. Following amide formation the protecting group must be removed so as then to be reactive for addition of the next protected amino acid unit. Furthermore, the carboxyl must be converted to a more reactive acyl form in order to react with the amino of the joining amino acid. 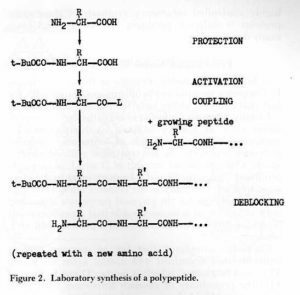 Hence the addition of just one amino acid to a growing chain involves several steps.5 (See Figure 2). Laboratory syntheses outside the cell involve several complications. For instance, racemization of the amino acids occurs during synthesis, leading to mixtures of proteins containing both D and L amino acids. In order to bring about a fair degree of purity to the polypeptide being synthesized, stepwise purification must be maintained. This process in long and difficult, and gives low yields at the end of so many steps. An alternate procedure, solid phase peptide synthesis (Figure 3), speeds up the process, but sacrifices purity.6 The important question to be considered is this: how could an unknown random process “evolve” a “soup” of enzymatically active proteins resulting in life when a highly controlled laboratory synthesis of these same proteins is difficult, produces low yields, and takes many days? In his book, Evolution: Possible or Impossible, James F. Coppedge pointed out problems associated with the fact that proteins utilize only left-handed amino acids. Usually when an amino acid is synthesized in experiments such as Stanley Miller’s synthesis producing amino acids from a mixture of ammonia, methane, hydrogen and water by the treatment with an electric spark, a roughly equal amount of D and L isomers are produced. Since the D and L isomers react in the same way, and are the same in all respects chemically and physically except for the physical properties associated with assymetry, it is inconceivable that a random event could account for the formation of a protein with all L isomers. Coppedge calculated that for an average protein molecule that contained 445 amino acids (of which 35 would be glycine, which is neither D nor L, leaving 410) the probability of random formation with all L isomers would be I chance out of 10123 (2410). In order to generate an idea of the magnitude of this figure, one could imagine one million protein chains forming per second for one quadrillion years. In that time, only 3.15 x 1028 protein chains would be formed. It is interesting to note physicists use a certain criterion: if the calculated probability for an event is less than 1 in 1041, the results are usually considered out of the realm of possibility. One interesting feature of enzymes is that many times their activity is controlled by the concentration of the end-product of the synthesis they catalyze. Several different types of control exist: (1) repression – where the end product inactivates the enzyme; (2) induction -where the end product activates the enzyme; and (3) co-repression – where the end product activates a repressor which deactivates the enzyme. In end product repression, the enzyme may catalyze the first of many steps in a reaction. As the synthesis nears completion, the concentration of the end product increases. The end product, acting as a repressor, binds to the enzyme at a specific site, forcing the enzyme into a different conformation. As a result, the enzyme cannot catalyze the reaction. Co-repression acts in a similar fashion, except in this case, the end product binds to the repressor, activating it, which in turn deactivates the enzyme. Also, enzymes can be activated, or induced, by the end product of another reaction.9 (See Figure 4). Such properties are important in the regulation of all of the syntheses that take place in the cell. How could these properties have arisen? It is a little like the old 11 chicken and egg” dilemma; which came first? Since the enzymes, substrates, repressors (or co-repressors or inducers) and intermediate reactions are so interdependent, if the origin of one is explained, then the origin of the others must also be explained, since each have binding sites that match the other. End product repression and control is absolutely necessary for the processes in the cell, since it regulates the amount of each product synthesized. Combined with the hundreds of other reactions in the cell, it makes up an “ecology” within the cell, where nothing is wasted, but everything is synthesized in exact amounts where it can be utilized by the cell. These interrelationships provide evidence that the cell was created as an entire entity, and did not “evolve” from separate molecules. Figure 5. Synthesis of enzymes. First of all, the DNA template is polymerized from mononucleotides in the presence of DNA polymerase and single stranded DNA. a. mRNA. This is known as messenger RNA, carrying the genetic code for the protein being synthesized. b.tRNA. This is known as transfer RNA.tRNA transfers the amino acids for the protein being synthesized. c.rRNA. This is known as ribosomal RNA, and makes up a structural component of the ribosome,complexing with the ribosomal protein, providing a framework for protein synthesis. Each RNA molecule has a specific function in the synthesis of proteins, with a three dimensional structure that has specific binding sites on which theyinterreact. Messenger RNA transfers the code for the protein from the DNA molecule to the ribosome, where protein synthesis takes place. Each mRNA will have a string of ribosomes which interpret the genetic code attached to it,resuitingin many protein molecules per mRNA. The ribosome, made up of ribosomal protein and rRNA, aid the synthesis by providing a framework upon which the mRNA and tRNA are able to bind together. Three nucleotides on the MRNA correspond with three nucleotides on the tRNA; this in turn transfers another amino acid to the growing polypeptide chain. 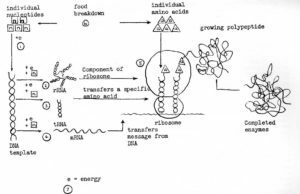 Functions of proteins in energy generation and the breakdown of food are also closely related to the synthesis of enzymes since the reaction cannot occur without a source of energy or building blocks from which the protein will be synthesized. Without enzymes to catalyze the production of energy in the cell, biosynthesis will not continue. Each step involved in the synthesis of macromolecules from monomers requires a great deal of energy, which is provided by activated nucleosides such as ATP. This energy is derived from assimilated food particles, broken down for use by the cell with the aid of enzymes. Many evolutionists attempt to explain the interrelationships that exist in the cell by saying that “natural selection” is responsible for them. The problem with this is the fact that at the molecular level, the proteins and polynucleotides which had not developed interrelationships would not have the physical machinery available for “natural selection” because there would be no mechanism to convert energy into useful work. Natural selection, as it is observed in living organisms, is a process that involves the weeding out of organisms that already exist in the environment. It does not explain the origin of these organisms or their genotypes. Mutations have been proposed as the “driving force for natural selection”, but at the molecular level, the situation is life or non-life. Mutations cannot explain the origin of the genetic code or the machinery surrounding protein synthesis, since they are a result of the operation of this machinery. To date, no other mechanism has been proposed. Therefore, taking the lower estimate, if one is to believe in “evolution”, then one would need to imagine 100 different proteins being formed by random processes, all left-handed, in the right weak bond conformations, specific for one another, coming together and taking their place in protein synthesis, energy production and the breakdown of food, plus the synthesis of cellular components. One would also need to envision the production and synthesis of DNA and RNA, lipids, polysaccharides (which, by the way, are all of the D isomer), and many other cellular components of which would have to be in the active state to carry out their specific function in the cell. Let us consider the interrelationships between DNA, enzymes, substrates, repressors, and co-repressors. During the course of “evolution”, if DNA “arose” first, and coded for the enzyme, it would have to contain the genetic information for the binding sites on the enzyme specific for the substrate and repressor, with the repressor having binding sites specific for the co-repressor. If the enzyme “arose” first, one would need to explain how the DNA “developed” a genetic code which would reproduce this enzyme, using the enzyme as a template. Watson ruled out the possibility of enzymes acting as a template, however, since the side chains differ in their composition in several cases only by a methyl group.14 Here again, the better explanation would be to say that it was created by God with that design in mind. Often, scientists will make the statement that an “enormous selective pressure” must have been placed upon the cell for the formation of a genetic code. Such statements are meaningless without an explanation of what would provide that “selective pressure”. Would an organism with an ambiguous genetic code survive at all? The genetic information that the DNA molecule must contain is astounding. How can one explain that a finger will grow out to a certain length and then stop? What determines the shape of a nose or the morphology of an eye? Furthermore, what are the associated regulatory processes that determine the shape and size of all of the parts of an organism? It is significant to note that the DNA content of an organism does not necessarily determine its “complexity”. Many fish and amphibians contain 25 times more DNA than any mammalian species. Many “closely related” species have been found that vary in DNA content by a factor of five to ten.” How could such species be “related”? *Faith is the substance of things hoped for, the evidence for things not seen (Hebrews 11:1). This material from Brock contains a perfect example of the exercise of faith. Most textbooks do not deal with the problem any more than that. But, in order to explain the existence of life, interrelationships must be explained. The abundance of interrelationships in living things indicate that they were created simultaneously. As there is ecology between the organisms, so there is an “ecology” between the cells within an organism, interdependent upon each other, and an “ecology” between the molecules within each cell. Each has a purpose and place. In the single celled organism, Escherichia coli, the chromosome codes for 2000 to 4000 different polypeptide chains. It is estimated that for the cell to grow on glucose as the sole carbon source, between 600 and 800 enzymes are utilized to conduct the syntheses needed for growth.18 Imagine the number of random events needed to explain these syntheses and their components! Consider that each of these enzymes is interdependent upon the others to do a particular job. Another amazing interrelationship involves repair processes that occur in the cell. Several types have been identified, involving repair of genes damaged by ultraviolet radiation. The best understood case is the thymine-thymine dimer, which occurs when two adjacent thymines are irradiated with ultraviolet light. This event normally kills the cell if left unrepaired, since the fused thymines cannot act as templates for new strains. Fortunately, the cell has a series of enzymes that will digest away these nucleotides and those around it, replacing them with new, correct, nucleotides.19 But, amazingly, if this repair synthesis is somehow blocked, another synthetic pathway exists that takes over and repairs the problem! 20Truly, this cannot be a product of mere chance, but it is a series of “checks and balances” instilled in life by the Creator to insure survival. Here, mutations should be mentioned, since many mutations occur due to mistakes made during the repair of damaged genes, or mistakes made while reading the DNA templates. Such mutations are either recessive, nonfunctional, lethal, repaired, or weeded out by other means. If nucleotides are switched in the genes, it will lead to nonfunctioning or partially functioning enzymes.21 It is interesting to note that evolutionists say that mutations provide the “driving force for evolution”; yet much fear is generated by the thought of mutations caused by irradiation with ultraviolet light, or by atomic radiation. Could the process of mutation, which is actually a degenerative process consistent with the second law of thermodynamics, account for “evolution”, which would have to be a “continually improving” process? What is the origin of these marvelous repair processes? Certainly not mutations since the repair processes function to eliminate or weed out mutations. Consider building a machine in which, if anything goes wrong, internal processes would be available for immediate repair. This is the situation that exists in all forms of life, even in the “least complex” cell. What initiates each of these steps? What starts the synthesis of the enzymes needed for the repair of this damaged region? How much genetic information is required? And, in the unlikely event that this pathway is blocked and cannot function, another pathway exists which takes over and performs the repair! Perhaps the most complex and least understood interrelationship occurs in the formation of antibodies. The introduction of a foreign particle into an organism triggers the formation of antibodies specific for this particle. All antibodies are proteins. 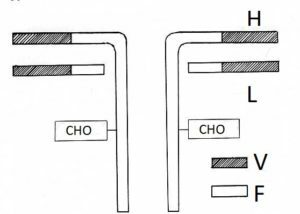 They consist of four protein chains, two heavy chains and two light chains (see Figure 6). There are two active sites on the antibody, each of which may bind to the foreign particle, rendering it inactive, and transporting it out of the cell. Each of these active sites is made up of variable sequences of amino acids which recognize the foreign particle and bind to it. The existence of distinct amino acid sequences for each specific antibody immediately raises the question whether there is a distinct gene for each antibody. Since a given antibody-producing animal can produce a very large number of antibodies, it is possible that a very large number of genes might code for the amino acid sequences of antibodies. For many years this possibility has seemed repugnant to many immunologists, aware of the immense number of antigenic determinants. Now, however, the dilemma can no longer be avoided. Since the amino acid sequences are different, there must exist corresponding differences in their MRNA templates, and thus in the relevant DNA regions. Figure 6. The construction of an antibody. H indicates a heavy chain; L a light chain. Shaded parts, as V, indicate variable regions; light parts, as F, fixed regions. From the introduction of the foreign particle into the organism to the formation of the antibody, several events must take place-either the construction of genetic information in a DNA molecule which would transcribe the specific amino acid sequence in the antibody, or the triggering of an already-existing DNA molecule specific for the antibody which neutralizes the foreign particle. Contemplate the origin of this amazing process! Consider the tightly controlled interrelationships involved, and their origin. How can the “recognition” of foreign particles by a cell be explained, when previous to entry into the cell by the antigen, it has no “knowledge” of what it “looks like”? Where would an organism get the “ability” to recognize these foreign molecules, take them apart, and repair them in this manner? Consider that each protein must have the correct amino acid sequence; the correct weak bond secondary, tertiary and quaternary structures; and be interrelated with other enzymes, polynucleotides, substrates, repressors, co-repressors and inducers. Correct genetic information for the formation of each of these components and the synthesis machinery for their production must exist. Energy generation and metabolism must also be available. Interrelationships provide evidence that life was created suddenly. Most macromolecules, when left outside a living system unprotected, quickly denature or break down into individual amino acids. The so-called primitive environmental conditions which have been postulated to produce these macromolecules would also aid in their eventual destruction. Long periods of time, therefore, becomes an enemy to the “evolution” of proteins. Life does not occur without the existence of interrelationships between these macromolecules, ruling out a random gathering of proteins and polynucleotides over a long period of time. An “ecology” exists between the molecules within the cell, as exists between cells within an organism, and between organisms in nature. All are interdependent upon one another. It follows that life began suddenly, created by God, with these interrelationships built in. 1Brock, Thomas D. 1974. Biology of Microorganisms. Prentice-Hall, Englewood Cliffs, N. J., p. IO 1. 2Hendrickson, J. B., D. J. Cram, and G. S. Hammond, 1970. Organic Chemistry. Third Edition. McGraw-Hill, New York, N. Y., p. 995. 3King, James L. 1971. The influence of the genetic code on protein evolution (in) Biochemical Evolution and the Origin of Life #2. North Holland Publishing Co. Amsterdam, p. S.
4Watson, James D. 1970, Molecular Biology of the Gene. Second Edition. W. A. Benjamin, Inc., New York, N. Y., p. 60-61. 5Hendrickson, Cram and Hammond, Op cit., p. 1004. 7Coppedge, James F. 1973. Evolution: Possible or Impossible? Zondervan, Grand Rapids, Mich., p. 71-79. 9Brock, Op. cit., p. 253-254. 10Watson, Op. cit., p. 330-396. 12Watson, Op. cit., p. 503. 13Coppedge, Op. cit., p. 72. 14Watson, Op. cit., p. 179-182. 15King, Op. cit., p. 3. 16Watson, Op. cit., p. 54 1. 17Brock, Op. cit., p. 537. 21Watson, Op. cit., pp. 416-43 1. 24Coppedge, Op. cit., p. 63.